Whether you decide to make it yourself or you buy one of the ready-made varieties now widely available, sugar free jam makes a great ingredient in cooking. Usually very sweet and packed with fruit, it can bring taste and texture to a range of dishes, and can be used either as an ingredient in its own right, or as a sugar replacement. Any supermarket or reasonably sized general store should stock at least one variety of sugar free jam these days. But you may need to look carefully as some brands don’t flag up their “no sugar” content. Reading the labels thoroughly will not only help you to identify the sugar free jams but will also enable you to see just what these products have been sweetened with. Some you’ll discover use apple or apricot juice or puree in place of sugar. Others may use an artificial sweetener. Where a label list includes “fructose” or “sucrose” the jam should not be classed as sugar free. These ingredients, as well as others ending in “ose” are added sugars. Alternatively you could make your own sugar free jam. Again, either using additional fruit juice or puree or an artificial sweetener, instead of sugar. The benefit of doing this is that you can find flavours to suit both your taste buds and the dishes you wish to make. Sugar free jam really is ideal for use whenever a standard recipe calls for jam. There’s no noticeable difference in flavour, consistency or quality. Try adding sugar free jam to your roly poly or your sponge pudding. It can be baked to high temperatures and will add that necessary dash of strong flavour. Try spooning sugar free jam into pastry cases to make jam tarts – go for apricot, blueberry and raspberry to create an assortment of colours. Don’t forget, you can also use sugar free jam as a cake filling. Spread it between two layers in a sponge on its own, or team it up with cream to give your cake some extra zing. But jam is such a versatile ingredient that sugar free varieties can also be used as a natural sweetener in any number of recipes. It can be stirred in at the “sugar stage” of a recipe or can be melted along with butter, margarine, cocoa powder or other ingredients.Take a simple sponge recipe, for example. Simply substitute your sugar for jam and beat it into the butter or margarine until creamy. If using strawberry jam, you may prefer to do this in a chocolate sponge rather than plain Victoria as the jam does give the cake a rather murky colour. Another alternative is to use apricot or lemon sugar free jam. Brownies, heavy fruit cakes and chocolate gateaux all respond well to the use of sugar free jam instead of sugar. The jam can be melted easily and helps contribute to the moist texture as well as adding a hint of fruity flavour. You can also experiment with jam in sugar free pies, puddings and ice creams. Once again, spoon it in at the sweetening stage. In pies, you can top your fruit with it, before sealing your filling in with your pastry. In tarts, it can be used to make a fabulous, professional-looking glaze. 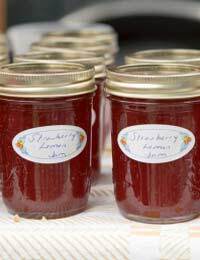 When making home-made ice-cream, use sugar free jam to sweeten sharper fruit such as gooseberries or rhubarb. It will simply enhance the natural flavour of your ingredients and contribute to a sweet dish that will literally melt in your mouth.